How to catch trout while Spey fishing (October is the perfect). When trout get large enough to do so, they will often eat other fish. A Spey rod is a very efficient tool for fishing larger flies that imitate baitfish and other larger trout prey such as crayfish imitations. The sport of "Trout Spey" is becoming very popular across North America. Learn the art of Spey fishing for trout in this class. A small lightweight Skagit outfit gives each angler tremendous advantage for presenting those imitation baitfish and crayfish flies to larger trout. This school will be taught on the Deschutes River, arguably the Pacific Northwest's best trout stream. Here native redband (rainbow) trout are picky and well educated: worthy of the best fly fishing skills. It is the perfect classroom. 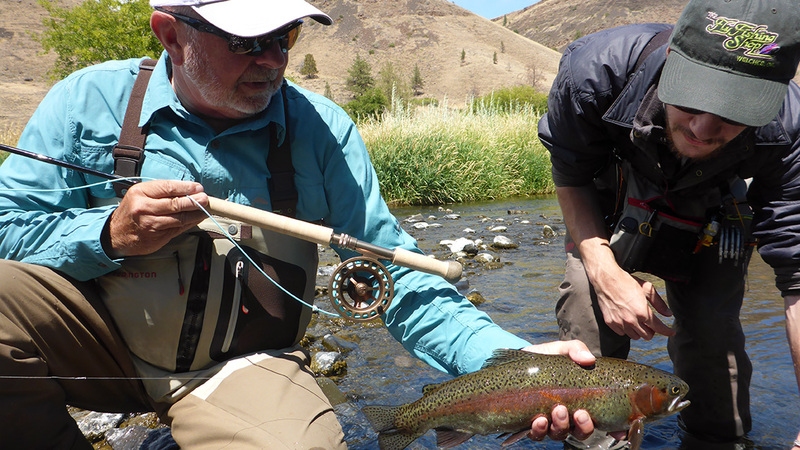 Your instructor is Mark Bachmann, a veteran Deschutes River fly fishing guide with 60+ years of experience with trout and over 35 years experience as a guide and instructor. This class is done while floating a section of the Deschutes river with a drift boat that is designed to seat two or three anglers comfortably. Minimum class size is two students, maximum is three. Although this school is limited to three currently, we plan to add room for more students, by adding more boats and instructors, as the demand dictates. We will have a waiting list after the school fills. This school is based on, but not limited to "matching the hatch" principles. We will start by surveying the river for likely baitfish that can create a feeding response in larger trout. Then we will search our fly boxes and pick a series of likely flies to use. We will repeat this process several times during the day as needed. Your instructor will put on a Spey casting demonstration showing how to position yourself to get the best advantage and how to present the fly to achieve a bottom hugging swing. Your instructor will also give a demonstration on wading and how to acquire the best wading skills. There will also be a demonstration on rigging and tying knots, and which sinking tip to use for certain types of water. As we progress down the river with the drift boat, our emphasis will change to students doing all of the fishing. We will fish until dark. Lunch, drinking water, and munchies are provided. Rod and reel combos are also provided as well as Deschutes Boater Passes. This school lasts about 9 hours on the water. Friday, October 19, 2018 Meet at: The Fly Fishing Shop 6:00 a.m.
Return to shop 6:00 p.m.
You will need to bring your own waders (or you can rent them from us), a rain jacket, polarized glasses, hook sharpener, leader clipper, and current Oregon fishing license are mandatory. If you have them, you are welcome to bring your own rod/reel setup, fishing vest with flies, fly floatant, extra clothes in a roll top waterproof bag, and items of a personal nature. Deschutes Boater Pass for group is provided in the price. You will need a valid Oregon fishing license, Warm Springs Reservation permit for Area-2, (Not provided in price). You may also want to consult our Guided Trip Equipment List for ideas. You will need to bring your own waders (or you can rent them from us), a rain jacket, polarized glasses, and hook sharpener, leader clipper and current Oregon fishing license are mandatory. If you have them, you are welcome to bring your own rod/reel setup, fishing vest with flies, split shot for weight, extra clothes in a roll top waterproof bag, and items of a personal nature. This school will deal with fine tuning your spey Casting Skills, but is not designed to be an entry level Spey Casting School. You should be an accomplished Spey caster or take one of our Spey Casting Schools prior to this engagement.